WHS Trap team at the Quail Forever Tournament. Casey Simmering a top 5 shooter hitting 49 of 50 clays, Trey Lytle a top 15 shooter hitting 48 of 50 clays. I can use beans to predict a design for a foil boat. Top rank is 4th period 50 beans and 550 milliliter to sink. 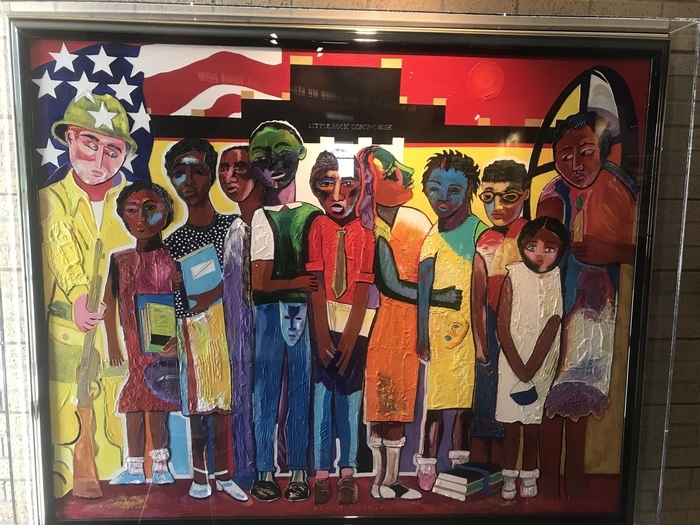 The Wynne Primary Media Center was chosen to receive a $2,500 grant through America's Farmers Grow Communities, sponsored by The Monsanto Fund, a philanthropic arm of Bayer. This grant will provide many exciting additions to our media center! WJHS former student returned to visit. Congratulations to Wynne Primary School's very own Misty Holbrook. Mrs. Misty is now an Orton-Gillingham Dyslexia Specialist. Final round of You Be the Chemist competition. Very proud of these WJHS students. You be the Chemist Comp. Good luck Intermediate and Junior High students! Pennies for Patients led by Student Council. Congratulations 6th graders for the highest total. Pennies for Patients! Let's BEAT cancer! Congratulations to the 2019 Sweetheart King! 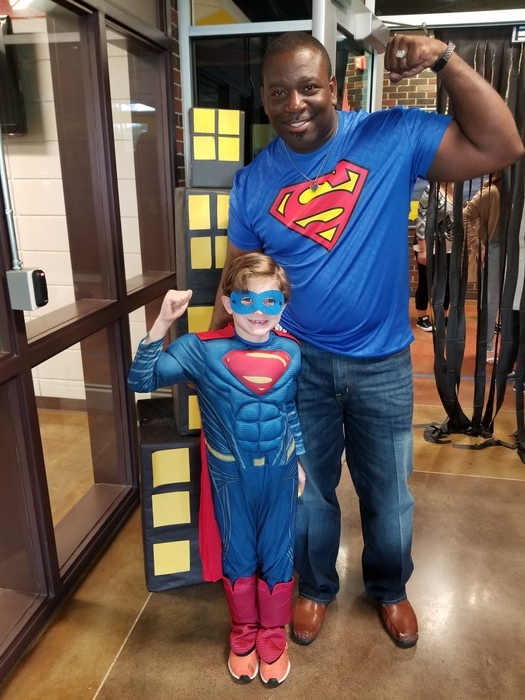 He raised over $1000.00 for the American Heart Association! Students provided research over a Chemical Reaction Experiment into an implemtplication process. 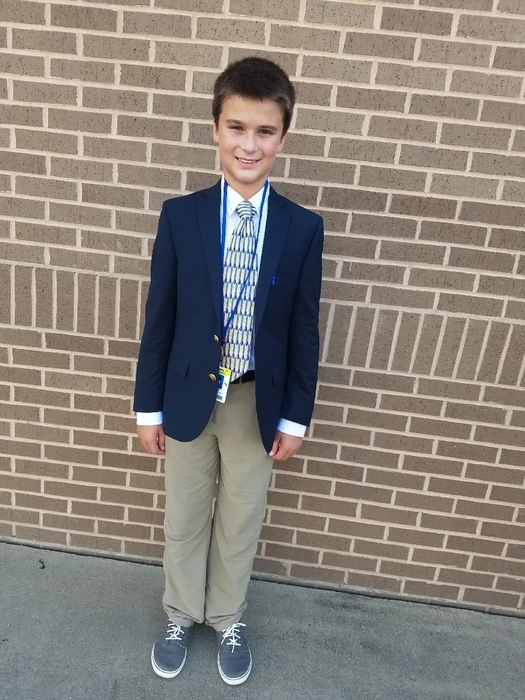 These students competed at the FBLA District 2 Spring competitions and qualified to compete at the state level April 1, in Little Rock. Please help us congratulate them on all their hard work and accomplishments. We are super proud of all of our teams who participated in the VEX robotics tournament in Jonesboro this weekend. We took home an Excellence Award and qualified for State. Shout to Mrs. Hitchcock’s class!!!! Each student had a piece to the puzzle!!!! Happy MLK Day!!!! Powerful teacher PLC’s focusing on prioritizing standards. Congratulations to the winners of the WPS 21 Day Water Challenge. Faculty participated in drinking 64 oz. of water a day, for 21 days. What a great way to be healthy! Congratulations to Kim Armstrong for applying and receiving a grant from Arkansas Environmental Education Association. Mrs. Armstrong was presented an award for $371 for a raised vegetable garden that she will work on with her science classes. Mrs. Watts’ students made Mr. Easley Christmas cards during their 12 Days of Kindness!!!! Junior high GT students reading stories to these precious children. We love our Students of the Week!!!! WIS is proud or our graduates. Congratulations to the winners of the WHS East Lab Bicycle Project. 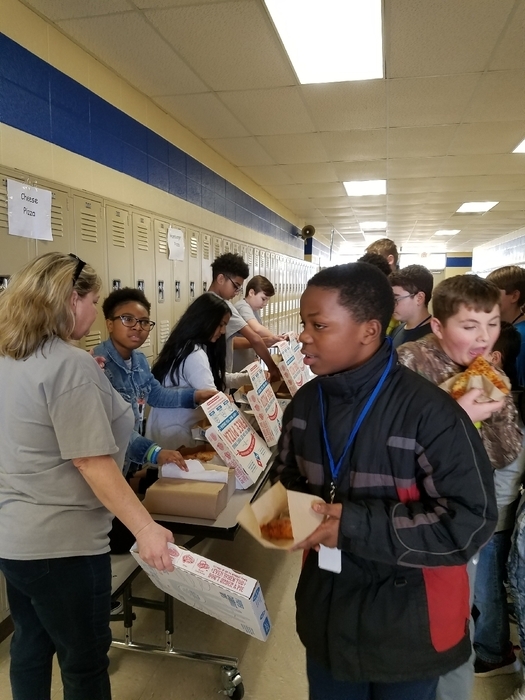 Students and staff members nominated students who are doing things to help us reach our mission and vision of being respectful, responsible citizens and making the world a better place. These students were drawn from a large number of nominations. Helmets were given in memory of Dr. Duke Heath and Duke Elliot Johnson. Merry Christmas from our Yellowjacket Bands!!! WJHS crystallized snowflake science lab. EAST students present their Smithsonian Main Street Project about Addison Company to Adams Jones with KAIT-TV. Art class decorating for Christmas! Congratulations to the Cross County Library Coloring Contest winners. Taylor Grace Emberton, Mason Shepard, and Karma Smith will receive a prize for their work. Congratulations to the WPS Spelling Bee participants. The top 4 finalist will advance to the Cross County Spelling Bee, along with our overall winner, Luke Baker! WJHS Robotics Team is preparing for competition. Faculty fellowship decorating the tree! We won!!! 6th grade quiz bowl!!! Good luck 6th grade Quiz Bowl Team! School will be dismissed today at 1:30 p.m. due to weather. Proudly serving our GREAT students! New Start Academy participated in The Veterans Day Parade. Great job students! Great Job Wynne Special Olympics Bowling Team! Educators working on Student Success Plans! Wynne High School students attended the Arkansas Land and Community Development Corporation 38th Annual Youth Conference. Austin Hill won 4th place, for which he was awarded $100. Don't let drugs "SNEAK" up on you! WPS Red Ribbon Week. Wynne Primary School is kicking off Red Ribbon Week! The book fair is at WJHS! WJHS Chess Club played well in Jonesboro this weekend! Dalton Szuflita is the first student to pass his Microsoft Office Specialist Certification of the year. He prepped, studied, and certified in a little over a week! We fully expect to see many more certifications from him this year. WJHS Teachers welcome parents tonight to share data and much more. Mrs. Taurone at Wynne Jr. High is greeting the students by giving them High fives! Excellent Jacket Spirit! Strawberry DNA on a stick. Mrs. Jordan’s class is extracting DNA from a strawberry. Fifth Grade students touring Ark. State University. We have another Art Star from Ms. Moore's 5th grade class, Juliann! Here she is to tell us about her Ancient Egyptian Self Portrait! EAST students Skyping with Shannon from the Smithsonian to get things in order for the Addison Shoe project. Thank you for recycling your aluminum cans! We have collected 27 lbs. of tabs for St. Jude Hospital to help with treatments, and 6 large bags of cans to help with a purchase from Heifer International. Wynne Primay is making the world a better place! Wynne High School Students and Staff are Dressed for Success! The WHS Mobile Application Development Class has been selected to develop the mobile app for the National Career Academy Coalition national conference. Nov 5-7 in Houston, TX. The students developing the app are Riley Clark, London Parsons, and Devon Sherman. Looking good in our new Chess shirts! Thank you Wynne Fire Dept. for visiting us today! So thankful for a district that allows our student to host an event like Fields of Faith each year!! If it is still raining at the start of Fields of Faith it will not be cancelled but will become a gym of faith. We will move inside Yellowjacket Arena. We will watch the weather and keep everyone posted tomorrow!! Pink Out. 7th grade Wins! 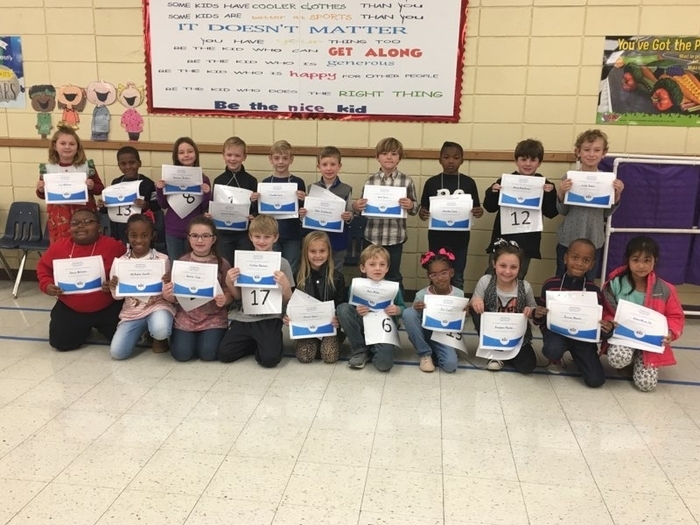 Students recognized for displaying kindness. 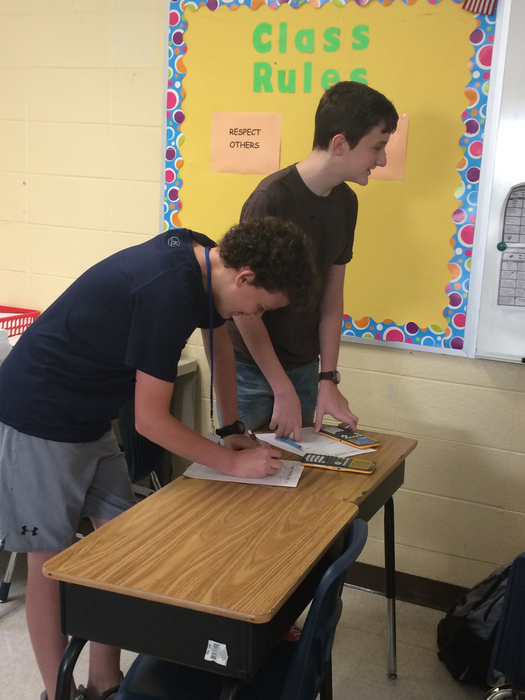 Students practicing for upcoming Quiz Bowl. 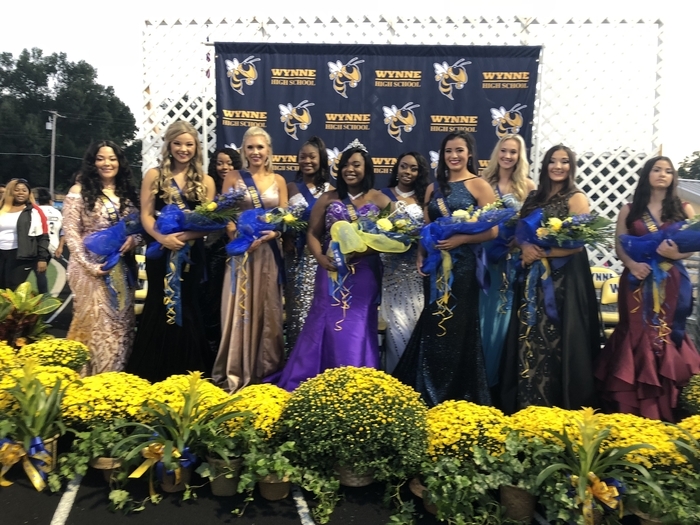 Homecoming 2018 Miss Tamia White and her court. Thank you Cross Ridge for joining us! Great job WJHS! PJ Day!!! Crowley's Ridge Park Ranger presenting to Social Studies classes! Human Anatomy students working on their cell biology project. 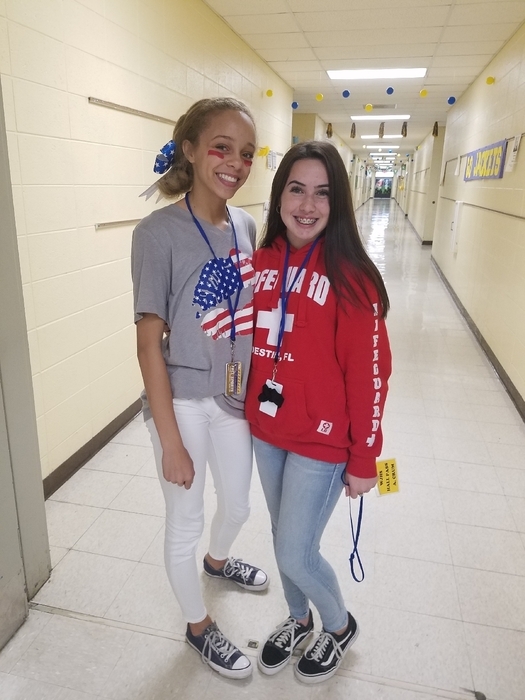 School Spirit with a Smile! Reviewing math skills in rotations. 7th grade Super BEEhavior students! Proud of our 6th grade good BEEhavior students!!! 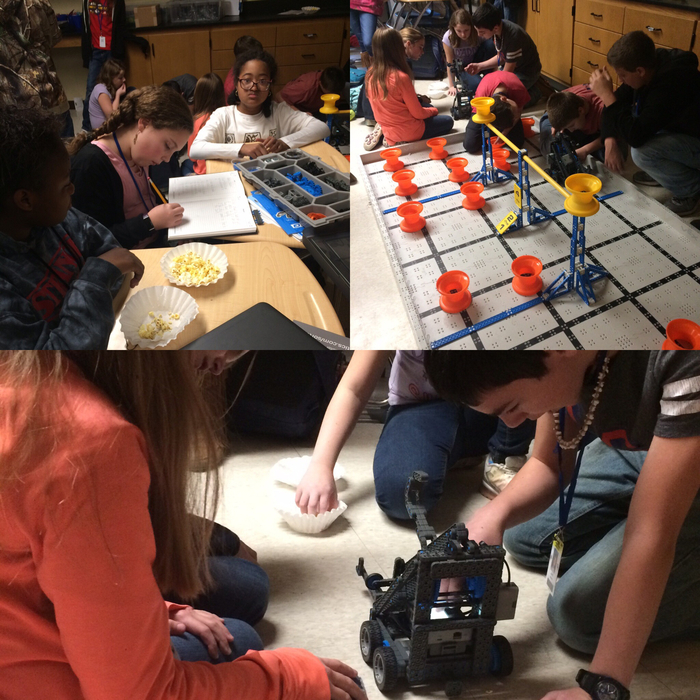 "How About a Little Robotics"
Jr. High Math/Literacy Night! Excellent strategies shared with parents. Mrs. Phillians and her Band of Drummers !!!!!!! WIS - C. Moore’s 5th Grade Literacy Class “Students created comic strips to present their understanding of dialogue and sentence types! We also started our interactive notebooks for The Lion, the Witch, and the Wardrobe! Students decoded descriptive writing to bring the novel to life in their own sketches, and practiced our “give me five & summarize” reading technique! Mr. Williams' 1st graders did a FANTASTIC job presenting their habitat projects. Students learned about different types of habitats through Main Idea and Supporting Details. Great job Jackets! Sweetie Pie Thomas, Otis, and Winn Dixie - from Mrs. Owens, Mrs. Tindall, and Mrs. Watson’s room. WHS Teacher Cadet students at Wynne Primary this morning. We love to see our potential educators getting in the classrooms. 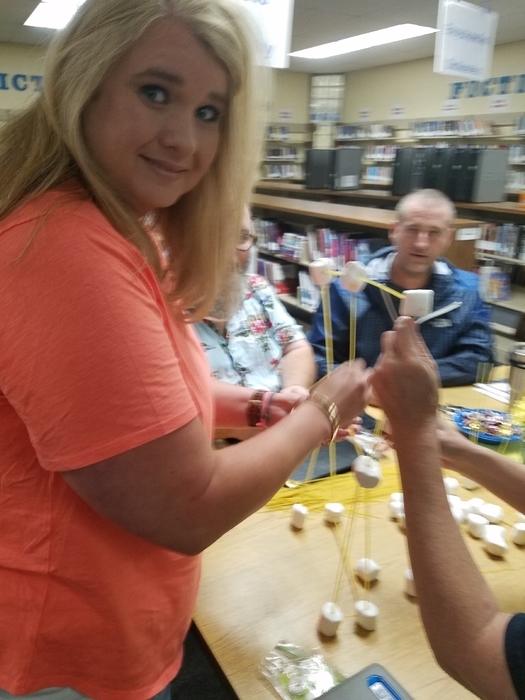 Tinkering with Ms. Kaley in the library!!!!! Thank you Lt. Colvin and Officer Hallmark from the Wynne PD for teaching WIS about Internet Safety. We have a Wonderful Staff!!!! Super Hero Minute to Win It! Thank you for a FANTASTIC night. We are honored to have spent this time with your families. Check out our Facebook page for more pictures! Parts of Speech Bingo Fun! Art class Yellow Jacket Swarm! Congratulations to Ms. Kara Souheaver! She was selected from 127,000 teachers to receive $500 toward purchasing books for her classroom library from Scholastic Bookclub. Ms. Kara had to write a short narrative discussing the importance of books in the classroom. She can't wait to get these books in the hands of her kiddos! 19 different staff members were nominated for The Academies of Wynne Staffulty of the Month for August. I am happy to say that Mrs. Bethany Holt has been selected as our August Staffulty of the Month. "She is caring, respectful, and patient with all her students. " Primary teachers working after school. Professional Development! Mrs. Shea received a grant for flexible seating from The YellowJacket Foundation! 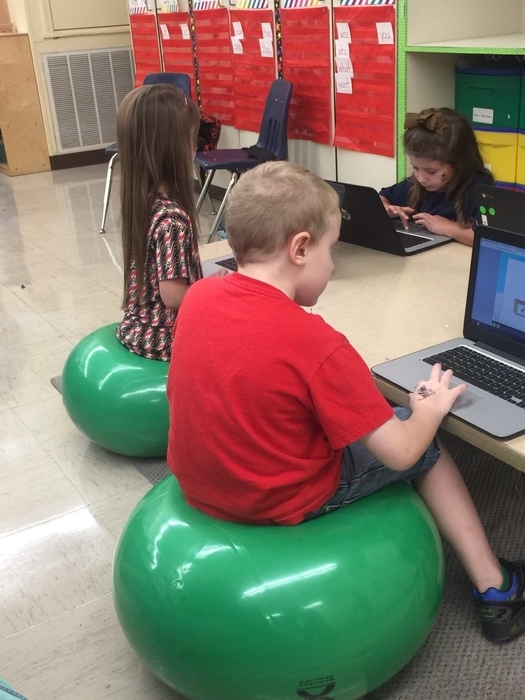 Flexible seating allows students the opportunity to choose their seating. Wynne High School Band! We are the best! 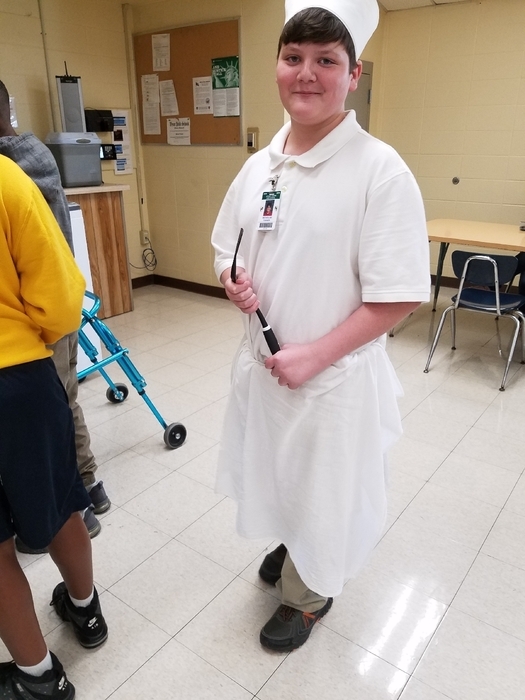 Our students at The Academies of Wynne enjoyed our annual club carnival today during enrichment period sponsored by our Student Council. The FINAL day for Senior Photos for the 2019 yearbook will be Sept. 4th at 8:30 am at WHS. A five dollar registration fee is required. Thanks Weatherford Dental Care for thinking of us! Mrs. Twyford's Class doing a Team Building exercise. “Honoring our Veterans & Active Military” FREE ADMISSION FOR ALL VETERANS & MILITARY WITH MILITARY ID OR IN UNIFORM Needing all military and veterans to come and help with the American Flag at half-time on the football field and be recognized. PLEASE COME AND BE A PART WITH US! GO JACKETS! Mrs. Vest’s Pre AP Algebra 2 Learning methods for solving systems of equations. Thank You Mr. Hendrix and WHS!!!! WHS working with WIS in the garden!!! Book Pass Time. A selections of books are available to peak students’ interest. Students read a small portion of the book. Notes were taken before passing the book. They can later check out the book. Work hard, and then you get to have a little fun! Who has the best RO? WPS DOES!! School pictures at WHS will be Tuesday, August 28 for grades 9-11. Forms were sent home with students this week. Nice seeing our 7/8th graders getting individual time with the Sr high head coaches. What an awesome sight seeing our coaches and high school players pour back into our future Yellowjackets!! Thank you Coach Myers and the 16 high school players for taking time out of your day to work with 45 young ball players. 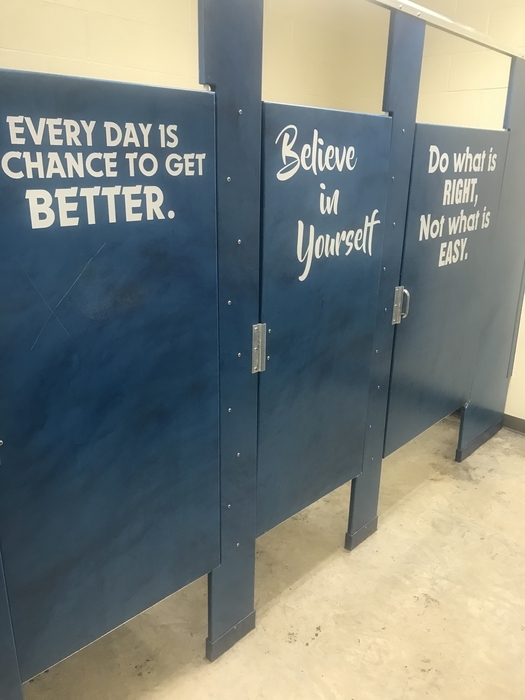 So thankful for for our school districts willingness to accept change. 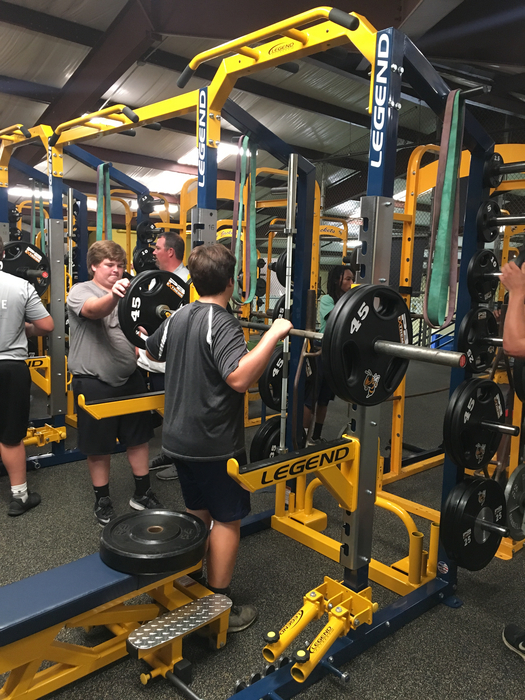 We’ve adjusted athletic periods in our day so our younger athletes can receive more individualize instruction and weight training from their coaches. This also allows our Sr high head coaches to work with the younger athletes as well. The only other place I’ve seen this take place is in the 7A at Rogers. Thank you for looking for ways to improve our athletic department. Athletics plays a huge roll in the social, emotional, physical and academic development of children. Students learning Chinese with Ms. Li. WIS Skyped with Senator Boozman. Mr Luther with Governor Hutchinson and Commissioner Key. Mr. Luther, Mr. Easley and Dr. Smith at the Governors Mansion for the State Teacher of the Year Regional Finalist recognitions. Congratulations Mr. Luther. We love 2nd chance breakfast! WJHS greets each student every morning with a handshake or special hand movements. Wynne Primary 1st Day of School! Thank you, thank you, thank you to Progeny for donating supplies for WPS teachers. We appreciate you!! A big thanks to Bob Simpkins and staff @ McDonald’s for providing breakfast to the WIS teachers. Teamwork Makes the Dream Work!! Primary teachers used teamwork to “escape” the classroom. Thank you to Extreme Signs and the Wynne Primary/Intermediate PTA. Also, in memory of Jim Pitchford whose light still shines bright @ the Wynne Intermediate School. Stand us hand up pair up! Thanks Mr Luther for leading a session on classroom culture today. Also shout out to Mr. Throckmorton for leading a session on SEL. WHS staff receive training in trauma sensitive schools with Meredith Johnson. Junior high teachers enjoying a scavenger hunt! The Wynne Yellowjacket Girls’ Golf took first place today in the Paragould Invitational at Paragould Country Club. Members of the team are Chloe Smith, Maggie Miller, Emma Cate Casbeer and Emma Miller. Junior High teachers scavenger hunt around the school. The Junior High Faculty enjoyed Village Creek State Park today! Innovation Hub, a great learning place for all.